People are looking for what you offer–and they’re looking online. 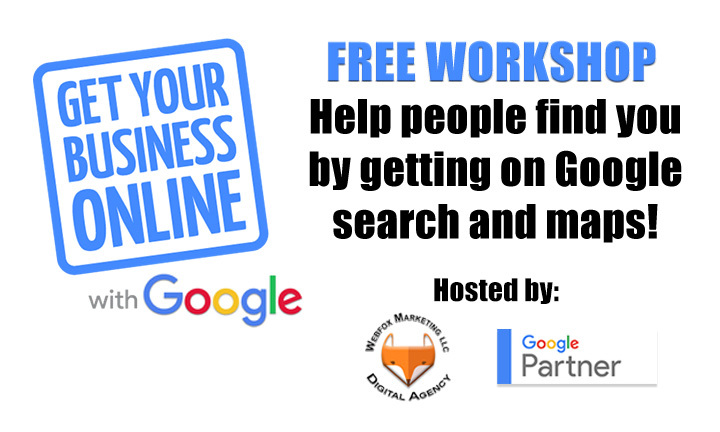 That’s why we’re teaming up with Google to host a free workshop to help you and your fellow businesses get online and grow. Help more customers connect with your business on the web–it’s free and easy to get started. We hope you’ll join us to learn more. Attract new customers with your FREE Google Business Profile. If you are looking for help with your Google listing, you are in the right place! Your Google Business Profile appears right when people are searching for your business or businesses like yours on Google Search and Maps. Google My Business makes it easy to create and update your Business Profile—so you can stand out, and bring customers in. • Expedite your Google My Business verification at our workshop! • Respond to customer reviews and more! As part of any solid Local SEO strategy, business owners should claim and verify their Google My Business listing. Our experienced instructor will help you claim your Google business listing. To increase your chances of showing up in Google’s Local Map Pack, Google Maps, and of course organic search, you must verify your Google My Business listing. And the best part? It’s Free! By claiming your business listing on Google, local businesses can highlight their business information such as their address, phone number, hours, photographs, events, and more! Web Fox Marketing is a website company in Livonia, Michigan SEO as well as digital marketing experts. In addition to digital marketing services, we are experienced in search engine marketing advantages, Google ads marketing (PPC), SEO services, social media marketing, and much more! A website is the beginning, as success throughout our digital markets depends on local ranking prominence and max exposure to several marketing channels. We are more than happy to assist you with any inquiries you may have. Contact us now and let’s kick-start building your web presence!